The class I'm assisting Jarrod in is Knife Skills and Decoration. Jarrod's goal for the students, as far as I understand it, is for them to learn how to use a knife in green woodworking. The goal isn't to create any particular items by the end of the three days. That said, it's difficult to just teach knife grips without showing the context in which they can be applied. 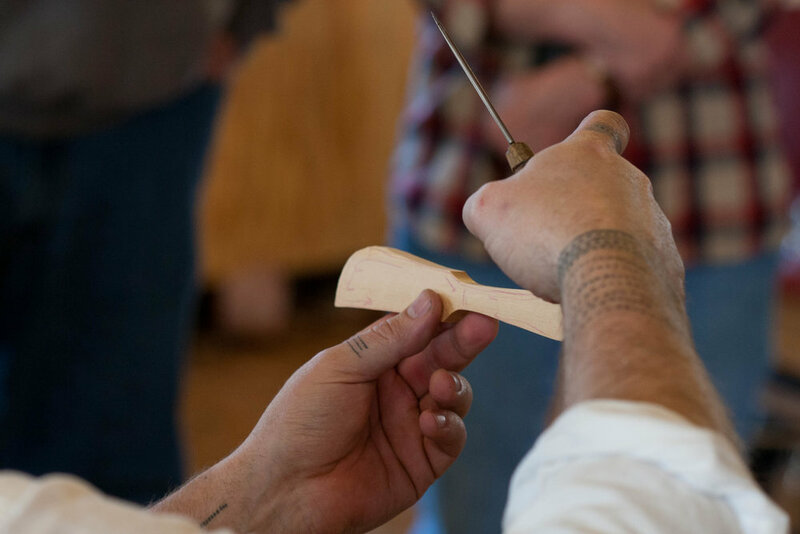 Yesterday we had students practicing the grips on random lengths of wood, but to check that they're understanding how to use the grips properly we need to give them some sort of end goal to aim for. Yesterday, and spilling over to this morning, the end goal was to carve a pair of matching chopsticks. If you've never freehand carved chopsticks with a knife, I recommend trying it. It's a very challenging task. The simplicity of a chopstick, and the need for it to match it's partner leaves little room for inconsistency. The students invest a lot of time in getting them as perfect as can, but at the end of the day, it's just a chopstick. The students tend to be less emotionally invested in them, so are more willing to take risks and try new techniques. Once we finished with chopsticks we moved onto butter spreaders. These are a great next step as they add curves. You now have to think about grain direction. There are a couple of extra grips to learn too. But butter spreaders are often perceived as more precious. As the students got closer to the finished form, you could see them getting more conservative with their choices. One student was working with a rather thick piece of wood. Both myself and Jarrod suggested he try splitting it in half. Thinning it down with just the knife would take a lot of work, and axe work wasn't being covered in this workshop. Splitting it had the potential to save him a lot of effort. It also had the potential to ruin the spreader. In the end he did split it, with success, but was extremely hesitant to do so. Getting too invested in our work is dangerous. It's important that we care about what we're doing, but we shouldn't get so invested that we end up making life harder for ourselves. It took me a long time to realise the importance of this lesson. Really great woodworking has bold, confident tool marks in it. The best way to get good at producing those kind of marks is to practice them. It takes time to develop the skill to accurately lay down a big bold knife cut. It's okay to start with smaller marks, but don't be afraid to (safely) push your limits. So long as the worst that could happen is that you break the spoon or spatula you're carving, you'll be fine. Also, taking the time to do exercises that are just practise is also important. Jarrod demonstrated a few techniques on carving decorations using the tip of the knife. The students practiced on planed boards. The goal would be to eventually decorate carved items. If we started out by asking them to add decoration to the butter spreaders they'd just spend a couple of hours carving, the students wouldn't have tried as many techniques as they did on the boards. I don't tend to add a lot of decoration to my spoons. Every now and then I'll do a little kolrossing. Aside from that I prefer to have the focus be on the simplistic form of the item. To some degree I think decoration is used to distract from poor form, but good decoration on a good form can make something excellent. I might also be slightly biased against decoration as I'm not particularly good at it. I just don't take the time to just sit and practice carving letters, or repeat the same chip carving detail 20 times until I'm good at it. Practising decoration, and performing improvement tasks like chopstick making is something I'd like to add to my weekly routine. Not only is it a chance to develop skills without the risk of ruining an otherwise serviceable product, it is a good opportunity for creativity.